299 Park Avenue aka the Westvaco Building is a 43 story commercial office building that was opened in 1967. The skyscraper was developed by Fisher Brothers, and designed by architectural firm Emery Roth & Sons. Fisher Brothers still owns a majority of the building (50.5%) while Rockpoint Investments owns the rest. 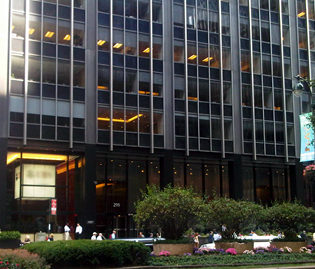 UBS Investment Bank has their New York headquarters in 299 Park Avenue, who occupies more than 50% of the floors. The building holds mostly private equity firms and investment banks. 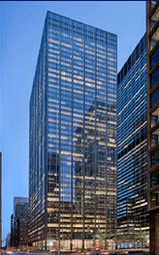 For more information about 299 Park Avenue, contact a New York Office Space broker today. A plaza encompasses the blockfront of 244 Park Avenue between East 48th and 49th Streets. The front facing portion of the public area is a elevated, on a narrow terrace, with a small arcade at the entrance. There is an additonal elevated terrace which extends from Park Avenue east along 49 Street terminating at a loading dock. This public plaza more expansive than the front facing terrace at Park Avenue. At this area a set number of rows stand as fixed wooden benches which are protected from the street by a perimeter of trees which has cause a significant use at lunchtime by building and area professionals. The corollary space on East 48th Street does not have benches. The through-block space at the rear presents a driveway, with posted signs indicating that the area is “private”. This back area offers little else to the tenant herein.